In front of my house sits an enormous old maple tree. It is the grandfather of maple trees on a street filled with them. It keeps a silent vigil in the winter, patiently waiting for the spring to arrive. It is home to a good many squirrels and even more birds. In the summer, this tree with it's tall canopy, provides enough shade to keep the grass cool and green, but not so much that it hides the sun. I love our old maple tree. Today as painted it, I couldn't help hope it would be around enough winters to see my children and their children grow old. I don't know how long maples live, I suppose I could find out, but I don't really want to know. I just want to go on hoping it lives hundreds of more years. It deserves it's own portrait and so today I painted it. This painting is done in oil on canvas board. The board is birch with a pine frame which I gessoed, then sanded. This painting was done wet on wet so I did not do an underpainting. I began with a basic sketch using a basic graphite pencil. Then I painted the background trees and the old Maple. 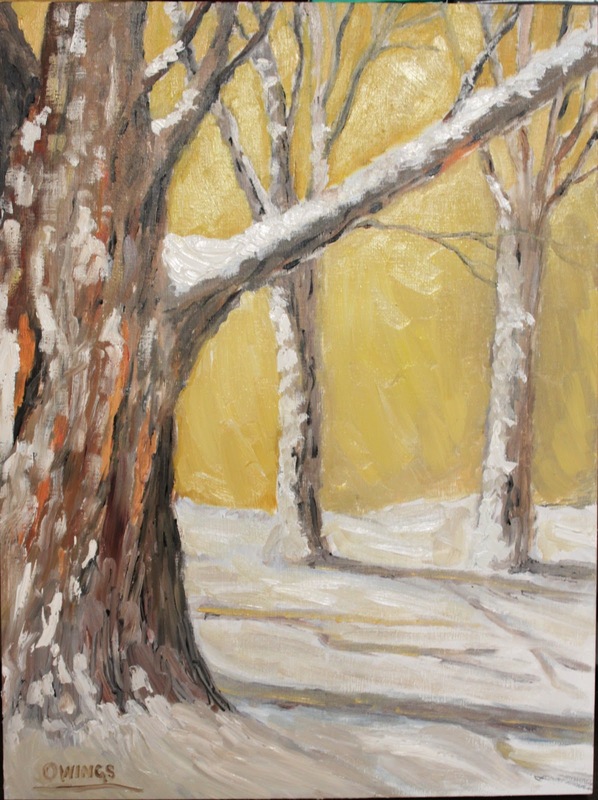 Then I painted the snow, using lots of complimentary colors such as yellow and brown. I added a tiny bit of blue here and there to the snow because that's the way it looked today. 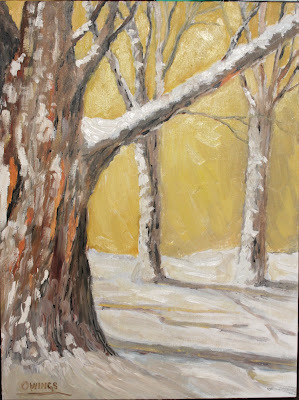 Then I added the snow to the bark of the trees and finally I painted the background. I used Holbein Aqua Duo oil paints and odorless mineral spirits. This painting is now in the collection of Mr. Mark Stefanchuk. This is a cool painting, and an awesome story to go along with it. I love the colors you chose, and the bark is fantastic. It makes me want to be in MN looking out the window, and maybe with a fireplace going(lol). I hope this maple tree will be seen by your grandkids when they have grandkids. Now, they will have the tree's portrait, too. Are you caught up in the Holiday spirit yet or have you had time to contemplate what you might paint or draw if you start your own art-a-day project?